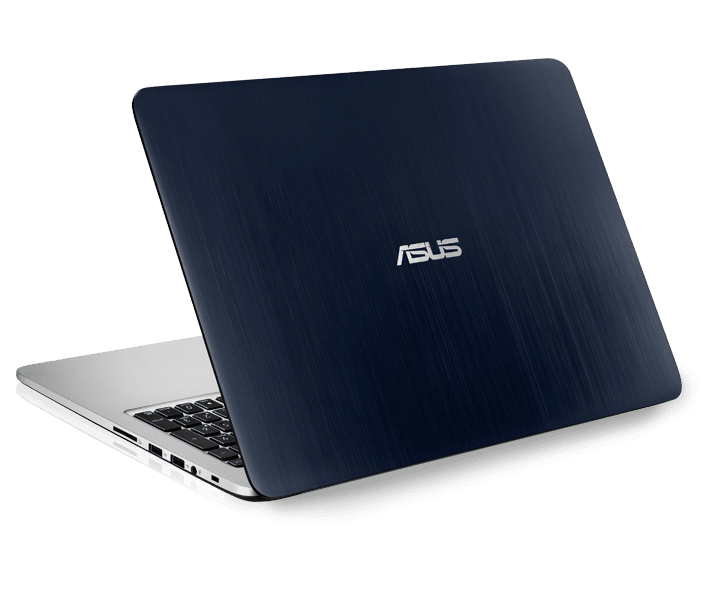 In 2015, many consumers who were looking for a lightweight 15-inch laptop that offered solid performance, a solid state drive, and a high-resolution display, bought the ASUS K501LX. The system made a few compromises in the design that you should be aware of, though. It may be a high-resolution display but it certainly could be better. Laptops have grown lighter and smaller over the years. Some people still want larger laptops for their screens, though. The ASUS K501LX is designed as an affordable and lightweight option with a weight of just 4.4 pounds and measuring 0.85-inches at its thickest. This makes it one of the lightest 15-inch laptops on the market, especially in its price range. The system does not feel like a major budget system thanks to its brushed metal finish. It would have been nice to have a single color finish rather than a silver lower portion and bluish black back panel. Like many laptops, it is powered by an Intel Core i5-5200U dual-core mobile processor. This lower voltage processor is common for many ultrabooks, but it provides sufficient performance for most people so the power savings are beneficial. It may not be the best option for those looking to do desktop video, but it still a solid choice. The processor is matched up with 8GB of DDR3 memory that provides a smooth overall experience in Windows. The standout feature of the ASUS K501LX-NB52 is the storage. The primary drive is a 128 GB solid state drive. This is not a huge drive, but it is primarily used for the operating system and applications. This makes it extremely fast to boot Windows compared to just about any other laptop in its price range. Since the SSD is small, ASUS includes a 1 TB hard drive for data storage. This is great for anyone who likes to keep a lot of digital media files on their system. If for some reason this combination does not provide enough storage, the laptop also features two USB 3.0 ports for use with high-speed external hard drives. The display for the ASUS K501LX is a bit of a compromise. The 15.6-inch panel offers good 1920x1080 resolution, which previously was not common in its price range. The resolution is certainly good but it has its issues. The TN display technology is not as sharp as others, and it offers some narrow vertical viewing angles that cause the color to drop off. Would it have been better to use a better display panel at a lower resolution? Maybe, but the higher resolution is certainly worth it. The graphics are handled by the NVIDIA GeForce GTX 950M graphics processor, but be warned that this is not a high-end gaming option. It can play some games up to the full panel resolution but it often needs detail levels turned down to achieve even 30 fps. Most games are better played at lower resolutions. Owners who use their laptop for web chats should be warned that the webcam is only a VGA model that lacks detail and clarity. ASUS is known for its keyboards, and the K501LX uses a layout similar to most of the previous K and N series laptops. It comes with an isolated layout that includes a numeric keypad on the right side but it uses slightly smaller keys than the rest of the keyboard. The design works well with a comfortable and accurate overall experience. The keyboard features a backlight that has three levels of brightness. The trackpad is a decent size but could have been a bit larger. It is slightly recessed into the keyboard deck and features integrated buttons. It offers a decent level of accuracy for both single and multi-touch gestures. ASUS claims that the 48Whr battery pack for the K501LX can last more than seven and a quarter hours of video playback. In actual tests, the laptop managed roughly six and a half hours. This is less than advertised but still quite good considering its size. It does not last as long as the Apple MacBook Pro 15 that runs almost two hours longer but the MacBook also features a battery pack with almost twice the capacity and almost triple the price tag. The ASUS K501LX-NB52 is extremely affordable considering it features the high-resolution display, dedicated graphics, and a solid state drive. The primary competitors for ASUS are the ASUS Aspire E5-573G and the Toshiba Satellite S55. The Acer is a bit more affordable and offers higher performance from a Core i7 processor. It also has a slightly better 1080p display, but the system does not run for as long from a smaller battery, and it weighs more. The Toshiba offers a bit better build quality and comparable running time. The problem is that the Toshiba uses a lower resolution display.